The second to the last of the original thirteen states is New York. Known as the “Empire State”, New York became the 11th state on July 26, 1788. The state’s flag was not adopted until 1901. On the blue flag displays the state’s coat of arms, featuring Liberty, who symbolizes freedom, and Justice, symbolizing justice before the law. The shield that Liberty and Justice each have a hand on pictures the sun rising against a clear sky behind three mountains. There are two boats sailing on the Hudson River. Above the shield is an eagle sitting atop a globe while underneath is a white ribbon reading the state motto Excels ior, meaning “Ever Upward”. New York was actually the United States’ first Capital from 1785-1790, where George Washington was inaugurated as the First US President in 1789. The Erie Canal was constructed and opened in 1825, now part of the New York State Canal System. New York is also well known for having the largest city in the United States, New York City. There are many famous and historic landmarks where millions of people visit every year, The Statue of Liberty being one of them. The Statue of Liberty was a gift from France and was dedicated in New York Harbor on October 28, 1886. The city is nicknamed the Big Apple. (the state’s official fruit is the apple). It is also home to Ellis Island, where more than 12 million immigrants have passed through here between the 1890s and 1954. It is currently part of the Statue of Liberty National Monument. Size Matters: While it is the third most populous state in the United States, it is the 27th largest state. Cars: New York was the first state to require license plates on cars! Coat of Arms: New York’s Coat of Arms was adopted in 1778, before New York even became a state! 1792: The New York Stock Exchange was founded in New York City. 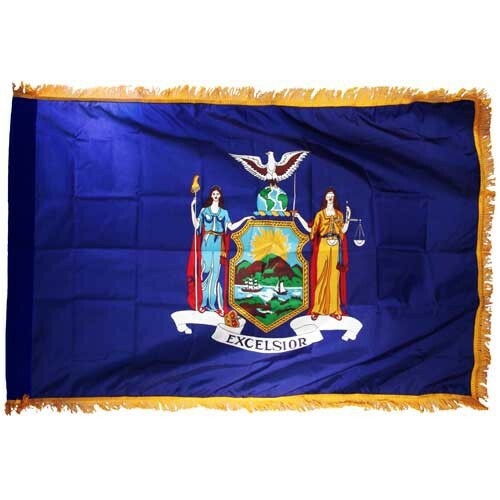 The United States Flag Store offers different sizes, brands, and types of New York flags and decor, check out what we offer here!